Tabular crystals, aften wi curved faces, columnar, stalactitic, granular, massive. Mey fluoresce white tae pink unner UV; triboluminescent. 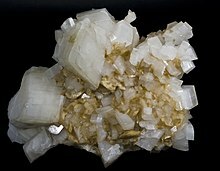 Dolomite /ˈdɒləmaɪt/ is a carbonate mineral componed o calcium magnesium carbonate CaMg(CO3)2. The wird dolomite is forbye uised for tae describe the sedimentary carbonate rock, that is componed predominantly o the mineral dolomite (itherwise kent as dolostone). ↑ Dolomite. Handbook of Mineralogy. (PDF) . Retrieved on 2011-10-10. ↑ Dolomite. Webmineral. Retrieved on 2011-10-10. ↑ Dolomite. Mindat.org. Retrieved on 2011-10-10.